No problem, I like to help others and give plusses. That and I think the conversation needed a bit of variety. Yeah X-men is one of the coolest cartoons I've ever seen. I really missed the Uncanny X-men tv series. I want to watch it over and over again. that is a dutch programm for children. oh you are in holland? i like spongebob too!! and invader zim! 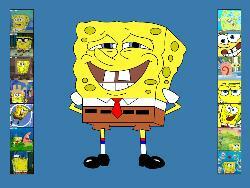 i just loved spongebob, he's so easily excited and amused, just like me, i love it!!!! 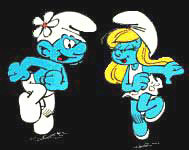 Smurfs!! I dont think anyone has said that one....are you an 80's child? I'm going to HAVE TO say Beavis & Butthead - at least it was a realistic projection of the modern youth value system. "huh huh, yeah. errrrr... yeah, huh huh". LOL they were pretty funny! I liked Daria better though.....do you remember that one? haha yeah, Daria was funny ;p. She knew they were really stupid, but i think she had a real soft spot for them. Tom and Jerry nothing can be matched wioth it....hahahaha hahaha......!!!!!! Yeah! Tom an Jerry is one of the oldest cartoon but one of the funniest series. It has lots of awards since their early release. I've got a collection of Tom and Jerry Dvd in my home. They're cute and hilarious, always makes my day. I have quite a few cartoons I like, but my fvourite ones would be The Simpsons, Family Guy, Tom and Jerry and Spongebob Squarepants. They are all funny and humourous shows and I love them! Yep I agree.... I like the Simpsons and I also really like King of the Hill. That is my favorite "pg" rated cartoon ever! i do love spongebob squarepants. i also like other characters at spongebob. like patrick, mr. crap and his crabypatty, and squidword and his ignorance at spongebob. Tom and Jerry is by far the most popular vote on this topic. Thanks. Right now I am watching The Avatar. It has a really good story line and is full of action. It also has very good character development. Out of modern cartoons it would be a toss up between Danny Phantom and Fairly Odd-Parents. Out of the ones I grew up with it would have to be Scooby Doo. That show is a classic. My family doesn't have Cable TV right now so I haven't seen the Fairly Odd Parents in quite a while. but I really did enjoy that show and though it was one of the better ones offered to kids these days. This is not my favorite but I do watch it at times. My favorite would be anything Winnie The Pooh. Winnie the Pooh is such a classic. I agree, and the innocence of it is so sweet.